Today’s lunch provided us with an interesting counter-study in the male response to the common question – where do you want to eat? In our office, the dynamic almost always involves 2 or more competing ideas and 1 or more absolute vetoes. On a day like today, it can take a skilled mediator most of the morning to settle on a lunch call; because much like Cartman from South Park, many of the Lunchmen will bail on lunch altogether if certain restaurants or cuisines are selected. For example, the monomaniacal Rabbit not only displays an unflinching devotion to all things salad, he also unequivocally refuses to eat Indian food. Often accused of xenophobia, Rabbit insists he just can’t stand to be in the same room as curry. His steadfast refusal has derailed many a fine lunch. Today, however, didn’t involve the Rabbit-maligned deliciousness that is Indian food. Today was a simple six man Friday call. After 45 minutes, Tank skillfully crafted a compromise: Tony’s in Cayce for the pizza buffet and a couple philly cheesesteaks. We headed off in multiple vehicles. Tex, Kali and Rabbit went ahead while Tank, the Dude, and I followed. When Tank’s care pulled into Parkland Plaza, a disturbed Rabbit came running into the parking lot waving his arms like a lunatic. Tony’s, he reported, did not have the usual and customary pizza buffet. We were dismayed. After a little wrangling, we abandoned Tony’s for the obvious audible, The Kingsman. Unfortunately, the “Pearl of Cayce” was slammed with no tables available, much less one that could accommodate a sixsome. Gridlock ensued. Palmetto Pig, Sandy’s Hot Dogs, Vellas, Which Wich, Carolina Café, and others were all met with the sort of resistance typically reserved by rednecks for universal healthcare. Throw a looming one o’clock conference call into the mix, and you’ve got some real logistical problems further complicating matters. Despite his best efforts, Tank couldn’t lift the group out of this jam, so the group splintered. Tex, Rabbit and I enjoyed a fabulous meal at the Kingsman thanks to a few regulars who just vacated their tables. Kali, Tank and the Dude, on the other hand, went down a dark and dangerous path. The siren song of free chips and salsa tugged the splinter cell, led by Kali, across the boulevard to Monterreys. Yes, that Monterreys. The one that caters equally to the destitute and the underaged. The one where the only thing authentic is the unreliable air conditioning. The one that Tank suspects uses reconstituted meat; the kind shaved from Bovine ankles, melted in a fat, powdered in plastic and frozen for your convenience. Tank’s horror story on his return made me uneasy. In fact, I can’t even stand to repeat it, and he can’t bear to write it down. The wretched place is so well known in Columbia, we won’t even waste our time providing a review. Suffice it to say that Monterrey’s is to restaurants what snuff films are to theater. Instead of recounting this experience, we hope you’ll learn from our mistakes. We admonish you, hell, we beg you: travel light in numbers, give yourself ample time, and be flexible for the good of the group. Your lunch depends on it. Another Columbia Landmark has fallen victim to the Great Recession. S&S Cafeteria, an after church destination cafeteria for decades, is closing for business on January 31, 2011. The Lunchmen are saddened by this news, given that S&S was the last remaining restaurant of its kind in the Capital City. We encourage everyone to pick up their grandmother this month and take them out for one last hurrah at the S&S. They are located in the old Richland Fashion Mall at the Corner of Forest Drive and Beltline Boulevard. Editor’s Note: Upon learning this sad news, Frodo, friend of the Lunchmen, lamented that two of the restaurants for which he has provided guests posts for the blog – Nice n’ Natural and S&S – have since gone out of business. Columbia Restaurateurs beware: if Frodo darkens your door looking to have a review-lunch, you may be out of business by the end of the month. It’s January, which means a few things here at the office – some people start using their lunch breaks to “hit the gym” and sweat off those holiday pounds (Tex), some people review their year end bonus and scream bloody murder (Tank), and still others look forward to another year of work and contemplate Jumping out of the window (Publican). For the Rabbit, January means one thing: my annual luncheon with East Bound and Down, my favorite snake-oil (READ: insurance) salesman. Once a year he buys me lunch and helps me ensure that Mrs. Rabbit will be taken care of should I unexpectedly head to that great salad bar in the sky. This year, knowing I wouldn’t be paying, I opted for lunch-men favorite Blue Marlin, which has been mentioned on several blog lists for various items, but never properly reviewed here. However, arriving at 12:45 we were greeted with a 30 minute wait, so we pulled an audible** and walked across Gervais to Liberty Taproom and Grill. Liberty Taproom is technically a chain in that it’s got a few locations in the Palmetto state, but it definitely doesn’t feel too corporate. Upon arrival we were told to seat ourselves anywhere in the bar area, and were quickly offered our choice of micro-brews. This being a “business lunch,” and me being a “total wimp,” I declined and instead opted for tea (remember I wasn’t paying, otherwise this would be water all the way). After a few minutes of serious talk, our food arrived. 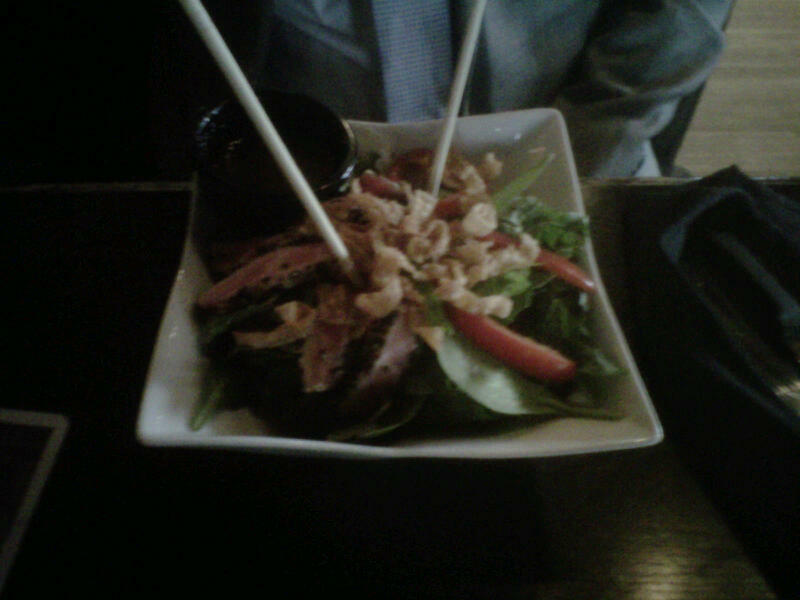 East Bound, determined to keep his svelte figure intact, ordered the Ahi Tuna Salad, which features red peppers, snow peas, green onions, rice noodles with an Asian honey lime dressing. The tuna was, as all tuna should be, rare, and the salad looked awesome. East Bound could not have been happier with his selection. To sum it up, he ate a healthy meal, but it was so good it felt like an indulgence. In my opinion that is the ultimate goal of a salad. I’m sure right now you’re expecting me to tell you I also went with a salad. However, since this was a review lunch, I felt that we had to explore other areas of the menu. Therefore, I tried to find something that would (1) satisfy my cravings for the vegetables I need and (2) fairly reflect Liberty’s cuisine. I spotted the Lunch Salmon item from the “Fish Board” section of the menu and knew I was in business. It’s a piece of salmon grilled and blackened (you can get it cooked a number of ways, but this is how I think its best), served with two sides. I went with collards and seasoned vegetables. The collards were among the best in town, and I actually found pieces of pork scattered among the greens. Normally, seasoned vegetables are treated by restaurants as an afterthought, and more time is spent on their calorie-intense counterparts like french fries or mac n’ cheese. Not so at Liberty. The veggies were fresh, sautéed perfectly, and seasoned with a little kick that made me stand up and take notice. I tried to take a picture, but unfortunately it didn’t turn out. Too bad, because the presentation was surprisingly sophisticated and really added to the experience. So to sum up, East Bound got a little new business for his 2011 book, and I got a free meal that was one of my most pleasant surprises from a restaurant in a long time. All in all, a successful lunch. I know that Liberty is more commonly known for its happy hour, but if you are in the Vista, its worth the trip for lunch. You won’t regret it. Keep it close – No doubt you are famished by the time you walk in the restaurant, so your hunger is only going to grow exponentially as your stomach leaves empty. Therefore, if you can walk to your audible place quickly, all the better. This works particularly well in 5-points, downtown, or the Vista. But, if you are heading out to somewhere more remote, it may require prior research to confirm (1) you likely won’t need an audible because you are going at the right time with the right amount of people, and (2) if for some reason you do, there will be a place close by you can live with. Keep it similar – If you had your mind fixed on Mexican and were all pumped to set a new taco eating record at Casa Linda, then an audible to your local sushi bar probably won’t do. You need to keep the theme of the original lunch intact – where else can you get a taco, or a burrito nearby? Columbia is big enough that this should not be a problem. Keep it cheap – Don’t let a lunch audible bust your budget. If you went out expecting to pay $6 for a burger and fries, don’t let people talk you into spending twice that down the street. While the food may be worth the price, it will seem extra expensive since you were mentally prepared to fork over only half of what your bill actually is. I have learned this the hard way. So remember, when forced to audible, keep it close, similar, and cheap, and you should be good to go.